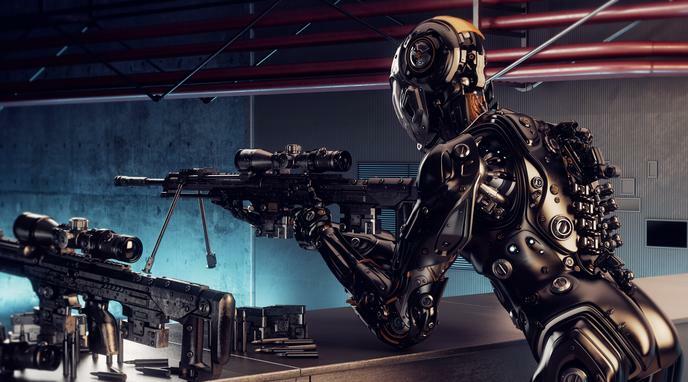 Autonomous Killing Machines: The Future of Warfare? Building and deploying AKMs results in moral problems. Moral problems are graver when AKMs kill humans compared to when humans kill each other. AKMs are high technology weapon systems which are ment for killing people. Because killing people is morally wrong the West should not develop them. If dictators or terrorists get Western developed AKMs in their possession, it will be the West that carries responsibility for misdeeds committed. With an advanced AI moral questions about the value of virtual life become more urgent. The West has a historical track record of exploitation. Thus, moral considerations do not seem to be very influential for policy decisions. Morality is no good guide for decisions about weapon systems as they are all problematic but, apparently, necessary. just causes then initial moral problems are justifiable. An unconditional, one-sided research stop on AKMs by the West does not reduce the moral problems when other states build them. AKMs reduce moral problems because they reduce the number of deaths of soldiers and civilians.